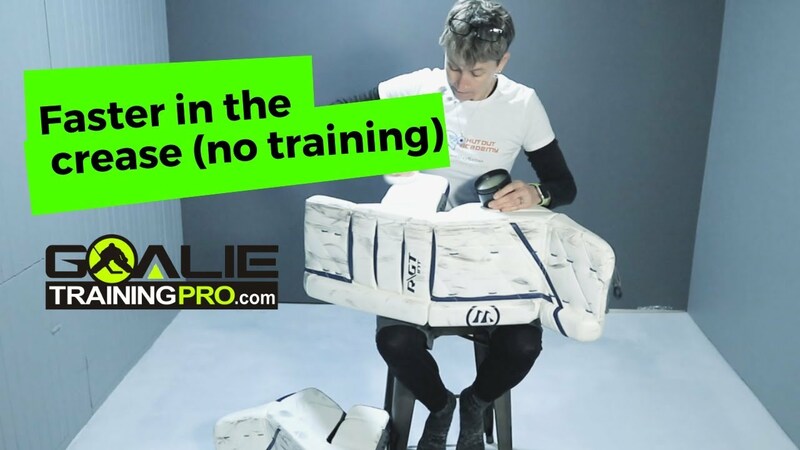 Hey, gang, it’s Maria here from GoalieTrainingPro.com with your episode of Goalie Training Pro TV. We’re going to focus on three quick in-season stamina circuits for goalies. Stamina in-season is a tricky thing. If you did your off-season training, if you’re on the ice four or five times a week in a good quality practice and you’re playing a game or two a week, you’re probably good. If you didn’t do your off-season training … it’s okay. It’s okay. We can’t go back and change it, but these are some things that you can add in. We don’t want to burn you out. We don’t want to wear you down. We just want to help you get some more pop, and get so that your legs don’t start burning quite so easy when the puck gets trapped in your zone, so that even when your legs are burning, you know, “Hey, I’m okay. I can still move and be dynamic,” and all that stuff. We can make improvements as the season goes on. Ideal scenario – you did your off-season training, you’re getting good quality practices on the ice, playing games. So then off the ice, you really need to work on that max strength, peak power and then sort of some goalie-specific, injury-prevention type of things. Okay, so let me just get right to it here. Circuit number one that you’re going to do, what we want to get is some explosive power but then some static holds. Sometimes when you’re moving, it’s not that bad, but it’s when you’re stuck or they have the puck in the corner or behind your net that really, really gets burning. We’re going to start by doing three squat jumps. Getting up as high as you can as fast as you can, then right into a five-second squat and hold. And I’m not just hanging out in the squat. When I’m there, I’m imagining that I have a 400-pound weight on my back. I’m squeezing my quadriceps. I’m squeezing my torso. Squeezing my arms. Everything. For five seconds. Then I go back into … One. Two. Three jump squats. Then back down and hold for five seconds. I’m going to start by repeating that pattern: Three jumps, five-second hold, for 30 seconds straight. Then I’m going to take a minute rest. As that gets easier and you feel like, “Oh, I didn’t feel like I was going die this time.” Oh, well, then it’s time to add more to it. Then you’ll do it for 40 seconds. Then you’ll build to 50 seconds. Then you’ll build to a minute. We’re not going to build more than a minute, but I always want you taking double the rest. When you do 30 seconds, you’ll rest for 60 seconds. When you build up to 40 seconds, you’ll rest for 80 seconds, and so on. Okay, so that’s number one: Three squat jumps, five-second hold. Number two, we’re going to add in another vertical component, recovering from your knees. You’re going to do a lateral hop. One. Two. Three. But then you’re going to do a post hold. You’re imagining you’re covering your post. You’re staying low. One leg can be out to the side. You’re going to hold that for five seconds. Then you’re going to come back down. One. Two. Three. Now I’m on the other side doing a post hold, and I’m going to hold this static position for five seconds. Guess how long I’m going to do that for? 30 seconds. Guess what I’m going to try to build up to over time? 60 seconds. Guess how much rest I’m going to take in between? That’s right, double the rest. Okay, let’s go to the last one. It’s going to be an alternate knee recovery for three. Just make sure to alternate your leading leg each time you come up for the knee recovery. Then I’m going to go into a shuffle, so then I’m going to shuffle, shuffle, shuffle. Shuffle, shuffle, shuffle for five seconds. Then I’m going to go into … One. Two. Three alternate knee recoveries. Shuffle, shuffle, shuffle. So I need to make sure I alternate my starting leg, and I also need to wear my knee pads … or you need to wear your knee pads when you do that. You’re going to be doing it for … that’s right … 30 seconds, building up to 60 seconds. We’ve got lots of good movement patterns in there. We have lateral pushes. We have big, just explosive leg exercises. We have those static holds. We have lateral shuffles from your knees. I think a good workout would be … Again, we don’t want to burn you out, so if you did one set of the squat jump and hold. If you did one set of the knee-down lateral-push post hold, and then one set of the alternate-knee recovery shuffles, I think that’s a fantastic place to start. Then you could go to two sets, staying in that 30-second range. But see where you feel that you need to work the most, what movements make you the most fatigued and you can adjust it based on that. 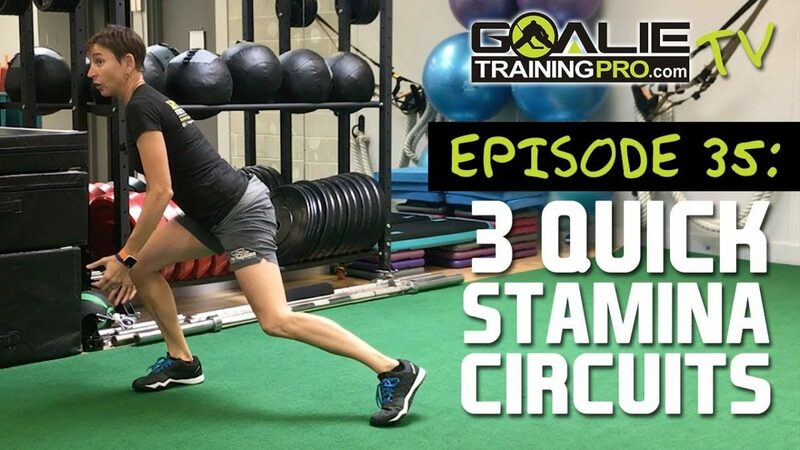 So those are three super simple circuits you can do without any equipment at all, that’ll give you those goalie legs that you need to stay in the game, to be quick and reactive. Even if the game goes into overtime, double overtime, you’re still good to go and stopping pucks.